Fitness monitors can’t guarantee that you’ll lose weight, but some of the newest motion tracking gadgets and the reports they generate can motivate you to move it, move it. The new digital monitors hitting the market compel you to be more active by competing real-time with others, compete against yourself in mini games or, in one case, even make donations to charity based on your increased activity. Who said technology couldn’t help tackle the obesity epidemic? 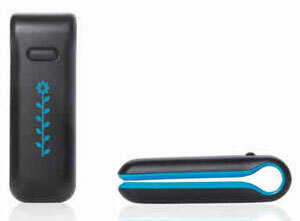 The discreet little Fitbit Ultra pedometer easily fits in your pocket or clips to your clothing. Built-in motion sensors, like the ones found in the Nintendo Wii provide greater accuracy than you find in a traditional pedometer. Plus, the new Ultra version of the Fitbit has an altimeter, so it can track the floors you’ve climbed. Not only packed with features like activity tracking (measuring very active down to mere sedentary behavior), the FitBit Ultra can even be worn overnight to track your sleeping patterns. It costs $99, but for an additional $49 per year, you’ll get access to more detailed reports. Sporting the tagline “Get Fit. Have Fun. 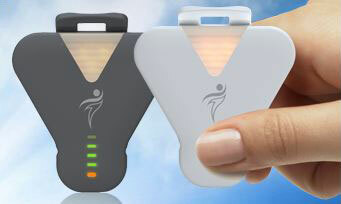 Give Back,” this pedometer fits on your keychain, and can benefit your heart literally and figuratively. Depending on your level of exercise, you can receive bonuses and game rewards to help motivate you, with digital tracking. For example, your movements could power activities on an enchanted virtual island. For those looking for additional heart benefits, Striiv will make a donation on your behalf toward providing clean drinking water for every step you take. (Can’t you just feel your heart pit-a-pat?) 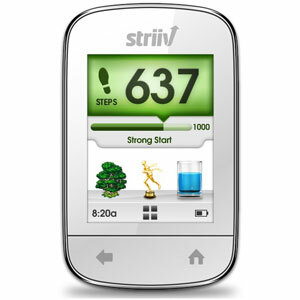 Striiv is available for pre-order on striiv.com for $99, and will be available on the market mid-October. By far the most expensive solution on the market, the BodyMedia CORE goes beyond a three-axis motion sensor, incorporating sensors that track galvanic skin response, temperature and heat flux for the most accurate picture of how hard your body is working, or not. It also provides data on sleep quality. The new CORE is a third the size of the previous BodyMedia sensor, the Fit, making it a lot easier to wear 24/7. At $179.95 on bodymedia.com, the CORE is the most expensive solution in this roundup, but it also provides the best data. Taking a more personalized approach to fitness, DirectLife monitors your progress, while offering real-life encouragement and support from a personal coach who you can contact for individual advice or just some encouragement. The DirectLife is slightly more expensive at $149 on directlife.philips.com, and while it has the least feature-packed device on this list, the personal coach interaction alone could be worth the cost.